Thoughts: Call of Duty Ghosts. Yeah, okay, I could do with a laugh. Based on previous comments I’ve made about the Call of Duty series it probably won’t shock you to learn that I don’t think Call of Duty Ghosts is a very good game. 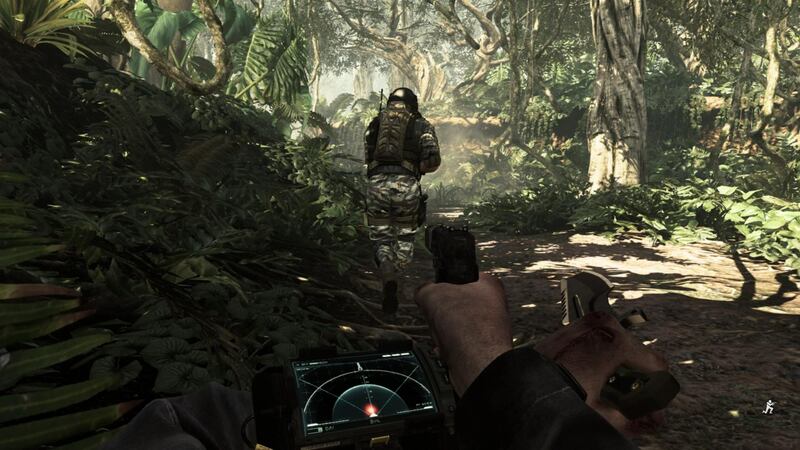 What might be surprising is that I don’t think it’s a particularly terrible one, either – its basic gameplay is bland and by-the-numbers as all hell, of course, which is only partly down to it having a reputation to uphold as the generic standard by which all other shooters are measured, but you don’t throw as much money at a game as Activision have at Ghosts without seeing some return on your investment and after a decade of experience Infinity Ward have gotten very, very good at making Call of Duty games. Put the two together and the result isn’t going to be winning any game of the year awards any time soon, but I think it at least avoids embarrassing itself the way the Medal of Honor and Battlefield series have in recent years. After skipping the last few games in the series I’m both encouraged and disappointed that Call of Duty has continued the series trend of becoming increasingly incoherent and detached from reality. 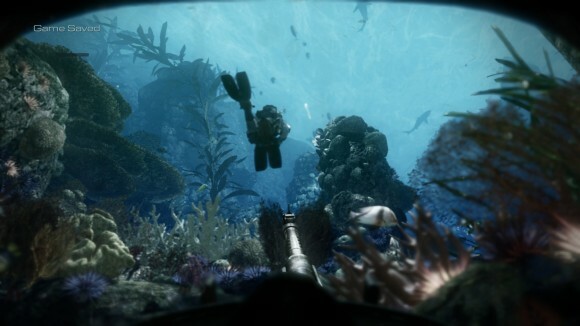 The original Modern Warfare wasn’t quite a masterpiece, but it was a very, very good game with some excellent ideas that was almost exactly like starring in a typical blockbuster action movie – while hardly being realistic, it maintained enough of a connection to the real world for stuff like the nuclear bomb and the Spectre gunship level to still pack quite a punch. Coming back to the series with Ghosts was a bit of a shock because that connection has now been almost totally severed; Call of Duty has taken the final step from military science fiction to just plain science fiction, with Ghosts taking place in a near-future world where the good old US of A is under attack by the South American Federation who hijacked their orbital weapons system to deliver a devastating first strike1. The opening and ending of the game are straight out of Moonraker while much of the rest of it takes place in a post-apocalyptic US, and the reason I say this is encouraging is because it seems like the series is finally embracing just how absurd it has become and using that to do some truly ridiculous stuff. It’s also disappointing, however, because no matter how far-fetched the scenario might be Call of Duty still can’t get away from the fact that it is, well, Call of Duty. 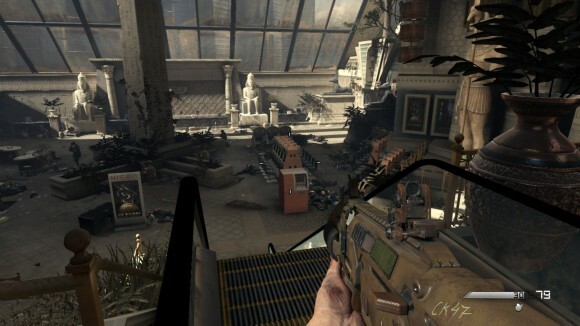 If you have played one Call of Duty game you’ve played them all, and no matter how many gimmicks and minigames Ghosts throws in – and there are a lot of them – the majority of the gameplay still consists of crouching behind a piece of waist-high cover, staring down iron sights at the heads of the enemy soldiers (who have been considerate enough to leave them poking conspicuously out from behind their cover) and then shooting them. Call of Duty is always going to be about shooting people, but I’m disappointed that after coming up with such a wacky scenario the designers couldn’t come up with some more imaginative ways to frame that. 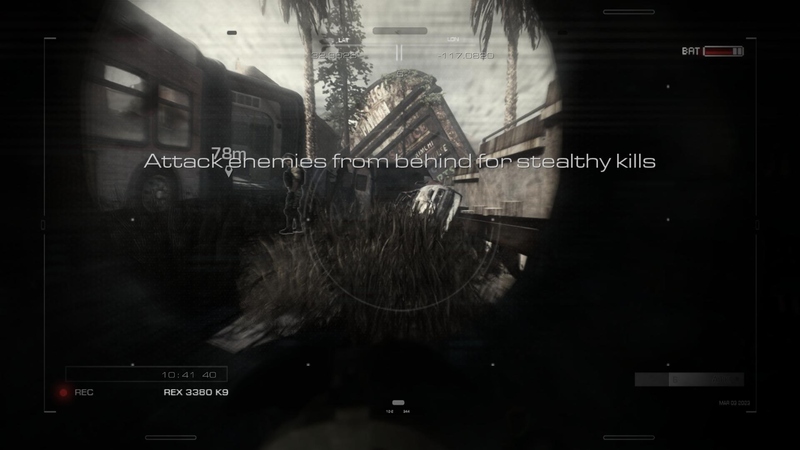 The only reason I give Ghosts any credit whatsoever is because it is trying at least. There’s the aforementioned Moonraker bits, where you shoot bad astronauts in zero-G, and then there’s the underwater bits where you need to take bullet travel time into account, but even during these levels I was kind of astounded that it still boiled down to shooting enemy soldiers who are hiding behind cover – even in space. This is probably fine for people who want exactly that out of their Call of Duty games, but the series has managed to do far more than this in the past and I don’t understand why it can’t reach for those heights again. Modern Warfare’s particular strength was the SAS covert infiltration missions, where it was more about stealth and secrecy than it was about shooting guys – although there was a healthy amount of that, too – and while there’s the odd “stealth” mission in Ghosts they’re scripted to all get-out, with other characters yelling at you to hide when you should hide and instant mission fails if you get spotted. The artificiality of the scenario is too obvious for it to be enjoyable, and these missions fail miserably at maintaining the illusion that you’re part of a covert special ops team rather than a rat running down a clearly marked path, with electric shocks in store if you don’t do exactly what the level designers want. I’m not saying that Ghosts needed to tread the same path as Modern Warfare, but I do think it needed to do something to distinguish itself from the legion of copycats that the series has spawned, and the vast collection of gimmicks and minigames crowbarred into each mission don’t even come close to fitting the bill. Still, they do at least provide variety. There’s so many of them – and they are almost never reused – that I suspect the intent was that each mission was supposed to have its own flavour, kind of like an FPS version of a Blizzard strategy game. Some of them are completely throwaway glorified quicktime events – drill this safe without busting the backplate! Keep the pressure constant while we overload the system! Upload this virus before the guards arrive! – but I appreciated the Apache level for what it was, as well as the couple of times you get to control drone airstrikes. These segments have framing issues in that you’re constantly switching back and forth from the main character’s first-person perspective to do them (Call of Duty has never been shy about switching viewpoints for a mission or two, so I do kind of wonder why they started trying to nail you into the mute protagonist’s head for this iteration) and they’re far too short, but when you’re actually playing them they’re well-executed and fun. Less so were the utterly ludicrous tank sections — largely because the physics of the tanks were completely fucked, with M1A1s and T-80s tearing across the desert at 100mph while bouncing off of each other like bumper cars – and the stealth section where you play as – sigh – the dog. Who can stealth kill enemies by attacking them from behind. I didn’t know it was possible to be savaged by a dog quietly, and to be honest it probably would have been more plausible if he’d snapped their necks using his front paws. At least the jungle stealth level was very well-done, since they drop you in all on your lonesome with nothing more than a pistol, a knife and a wrist-mounted motion tracker (think Aliens) that lets you know where the bad guys are and leave you to get on with it without telling you to press F to push button every two minutes. Unfortunately I think that superficial veneer of variety that the minigames and mission themes try to provide ends up backfiring somewhat, since Ghosts consequently comes across as a somewhat bizarre and disjointed experience. It’s almost like each level was being made by a separate team in isolation and only stitched together into a whole during the last six months of development. This feeling of incoherence doesn’t do the game any favours, and neither does its nonsensical, meandering plot that fails to tie this disparate set of levels together in any logical way. You visit some truly beautiful locations in Ghosts – it’s got one of the best-looking jungle levels I’ve seen, and the underwater level was also pretty sweet despite the roasting it got over the advanced fish AI – but there’s no getting over the fact that these locations are in the game just because that’s what the developers wanted and not because they were justified in any way by the paper-thin story. The whole game plays like a sightseeing trip punctuated by the odd collapsing building, except your fellow holidaymakers are a bunch of gruff, humourless types who punctuate every other sentence with meaningless military jargon like “HOW COPY” and “OSCAR MIKE”, and who are exactly as insufferable as that sounds. After all this, then, and despite its attempts to spice things up with the minigames, Call of Duty Ghosts ends up being exactly what its reputation suggests: not good, not bad, just 40 gigabytes of refined weapons-grade mediocrity with a massively overinflated price tag. Activision like to sell Call of Duty games at a premium price point (even the decade-old Call of Duty 1 will never retail for less than a tenner on Steam), similar to Blizzard, but you can at least make the argument that Blizzard’s games are sometimes worth the extra money. Ghosts most definitely is not; it doesn’t have the style or primitive self-awareness that Modern Warfare displayed, instead expecting the player to unquestioningly swallow yet another made-up war against a made-up enemy that is nevertheless keeps one foot firmly anchored in the tedious military dullness that the series is known for. Call of Duty is probably the least likely gaming franchise on the planet to ever take a risk, but in order to be a trendsetter you need to exhibit at least some degree of innovation and Ghosts struck me as something of a dinosaur in spite of its silly science fiction setting; it’s the same game in a different package with little that’s new or interesting to say. It gets points for effort, but since its attempts to inject a little life into the proceedings come off as gimmicks more than useful additions to the gameplay I’m going to have to rate them, and Ghosts, as something of a failure. Video game developers are *obsessed* with the idea of dogs as unstoppable, silent killers. My very favorite is the Game of Thrones RPG, where the obligatory warg character has a dog who he can possess for stealth sections. The dog is hideously ugly and absurdly small, no larger than a terrier, really. So small, in fact, that if an enemy spots you he’ll just kick the dog away. But creep up behind and the dog leaps up and tears the enemy’s throat out without alerting anyone, with a lot of stealth sections boiling down to a rampaging dog murdering everyone in front of him. Actually, I need to see if that game is cheap on Steam. The console version had frequent, atrocious loading times that killed my will to play, but the game itself, while flawed, had some interesting ideas. Video game developers are obsessed with the idea of dogs full stop, to the point where I’m surprised the list of Fictional Dogs in Video Games on wikipedia isn’t ten times as long as it is. But you know, I’m OK with this particular obsession. Some of the games that use it–like Okami–are really fantastic, while even mediocre games–like Game of Thrones–end up with something that manages to be charming in spite of itself. How do these games take up so much disk space these days? Is it all just audio, like in Titanfall? In any case, commenting almost seems kinda superfluous, because these things stopped being for me a long time ago and bemoaning the waste of talent and resources seems silly given that they make millions each time and will continue to do so until the series runs into the ground. I always assumed it was the sheer amount of unique assets. I mean, look at those screenshots! That’s a gorgeous, almost photo-realistic coral reef, and I’d bet money it only takes up *maybe* 20 minutes of gameplay. Bioshock Infinite had a huge amount of unique material–like Comstock’s museum or the shopping area or the beach–which helped keep things interesting but caused the game to clock in at a staggering 25 gigs. Huh, was it really that big? My current internet would begin to cry at that point (I miss my brief dalliance with city-centre fibreoptic internet). But yeah, it amazes me how much work goes into details that nearly no-one will see and that remain onscreen for only seconds. At least for stuff like GTA you spend more time in the same streets, with side-quests encouraging you to look around the small corners of the artists’ work. I reinstalled Binfinite to play the DLC recently – it came to around 34 gigs in total. Probably lack of packing for number of reasons. HDDs are bigger, there are no CD/DVD constraints so they drop everything they can there. CD quality audio, lossless video, unpacked textures. I remember games having sounds in 128 kbps MP3 and video grainy as barn from hell. Morrowind is a good example, it was all on one CD with solid soundtrack and some video. Bethesda is still doing it with Skyrim being 4-5 Gb while obviously being bigger than any Call of Duty game. You want to know the best part? That was just the single player. If I’d checked the Multiplayer box when downloading it from Steam it would have come to a cool 70 gigabytes. But yeah like Darren says, every single level is different and requires basically a whole new set of art assets. Must have been horrendously expensive to produce, too. Ahem, at least South American Empire is original. Though curiously it’s the same trend of brave American boys beating people who don’t need any additional foreign involvement to make their lives miserable. USA, will you ever find worthy opponent again?.. Anyway those ultra-realistic shooters will only get to me when they’ll find a way to be really realistic while remaining entertaining (like ArmA, only good) or drop those masks and enjoy their mechanics (like Bulletstorm). I don’t particularly care about WW2-style urban fighting even if you add a hundred minigames. To be honest any nation invading and causing serious bother to the US is a bit of a stretch for the foreseeable future. But sure, at least South America shares something of a land link with the US, obviating the need to defeat the US Navy (hello World in Conflict, which is a great game despite the absurdity of a Soviet army sneaking into the West Coast). Yeah, uh, about that: the Federation has defeated the US Navy, as evidenced by them only having one remaining aircraft carrier. This is why I think that in a game that finishes with a Moonraker-style space battle over an orbital doomsday device, having the US be invaded by another country is still the most ridiculous thing that happens. I liked the setup in Flashpoint: it was a really small-scale brush war on an insignificant island of the sort that crops up a couple of times every decade, which made the fact that the US didn’t immediately crush everything with overwhelming force somewhat plausible, but from the perspective of somebody on the ground (i.e. you) it was still terrifying and deadly. It’s a problem not confined to shooters. I much prefer games to be based around small, personal conflicts, but game developers have no idea how to write intelligently and so try to invest the player by having the fate of the nation/world/universe be at stake. And in CoD’s case, that necessitates outright inventing an opponent strong enough to take on the US in open warfare. The entire approach is fundamentally flawed. Yeah, I still think Flashpoint is Bohemia’s most successful single player endeavour (it helps they had Codemaster’s Q&A dept and perhaps a little more time to test without running out of money). The issue with global conflicts is that sequels have to get stupider to up the ante. I mean, the US has been invaded and blown up how many times already? Just file that under “armageddons” and let me get back to my sudoku. On the other hand, you know what it means when you read the game takes place in single area or city. It means you’re in for repetetive levels in the same environment with the same enemies. Sometimes you get Jagged Alliance 2, sometimes you get one-dungeon RPG like that Wizardry-like game from two years ago I can’t even properly remember. You want to fly over the world even if it means 40 maps like in Firaxis’ XCOM.